Can I buy your books in paperback or hardcover? Unfortunately, not at the moment. 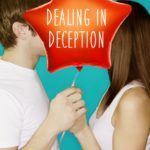 FLIRTING WITH FAME is available in ebook and audiobook format, and DEALING IN DECEPTION is available in ebook. The good news is, you don’t need an e-reader to read them! Ebooks can be read on any electronic device! As of right now, you can only get FLIRTING WITH CELEBRITY (the French edition of FLIRTING WITH FAME) from here, and the German editions of both of my books will also be on paperback, soon. Can you send me a free copy of your book(s) to review? Sadly, I don’t have ARCS to hand out. But I do a lot of giveaways on Facebook, Twitter and through my newsletter. I love giving free books to readers, but you gotta win them. Do I have to read FLIRTING WITH FAME in order to read DEALING IN DECEPTION? Nope! Both books are written as stand-alone books! That being said, they are companions, so characters you might recognize from the first book will pop up in the second, but those are more little Easter eggs for those who liked book one. I want to be an author, too! Can you read my book/query letter/pitch? I wish I had the time! I am so busy with my own writing, that I really can’t read other books right now. However, I do mentor in Pitch Wars some years and will sometimes have query critique contests over on Twitter if I have some time. If you’re looking for someone to read your work, look for a critique partner within the writing community. There are lots of forums and groups who want to help! Can I have a signed book? Like I mentioned, my books are ebook only for now, but I am over on Authorgraph, so you can click the image below and request an electronic signature for your ebook! Or, if you want a signed bookmark, fill out the form at the bottom of this page, and I’ll send one out to you, while my supplies last (please note: I send in batches, so you may wait a few weeks to get it).